I really didn’t know what to expect from this album as Bobby Bare Jr. Has hardly ever grazed my radar over the years; but after repeated listening; especially late at night in the car, I am now a convert. Not only does Bare wear his heart on his sleeve in his lyrics but he puts his soul out there too in his brave choice of playing styles. Billed as a ‘break-up’ album; Bare quickly lets us know what to expect with the feedback drenched into North of Alabama by Morning which has the deeply troubled man singing through a decoder as guitars, bass and drums have a knife fight for dominance in the background. The story begins to unfold on If She Cared which is a bit lighter in tone; but still deeply and darkly Gothic in flavour as our hero sounds like he’s on the verge of a breakdown pouring his heart out to the new love in his life. Although not easy on the ear I’ve grown to love The Elegant Imposter mostly because it’s a great song but there is some mysterious high pitched instrument weaving a path all the way through which lends an almost Hitchcockian feeling to the track. 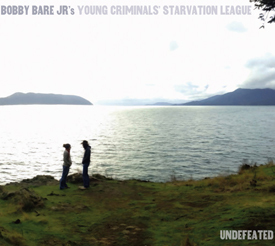 Bobby Bare Jr’s Country background finally comes to the fore on the Hayes Carll co-penned My Baby Took My Baby Away which has the spookiest banjo playing since the Deliverance soundtrack. Without actually hearing Blame Everyone (But Yourself) I knew that I was going to love it – and I do; because boy; does that sentiment apply to so many people in my life! But in the case Bare somehow manages to combine British Indie and an unidentified Show tune to create a really, really angry Country song. Perhaps the best and certainly most memorable song here is The Big Time which is a musicians song that will resonate with broken hearted musicians the world over as Bare tells his ex-lover “You’re gonna miss me after I hit the big time/ Gonna get brand new famous friends” and “I will move far away/only thinking about myself” all sang/spat out to a rock fuelled Mariarchi beat – absolutely wonderful in my opinion. YOUNG CRIMINALS STARVATION LEAGUE won’t be for everyone, as it’s not an easy listen in either tone or content; but if you ever wondered what Leonard Cohen fronting Oasis singing Elvis Costello songs would sound like; I’m guessing a bit like this.